Inspired by United Way of the National Capital Area’s Do More 24™ campaign and working in partnership with the Maryland Food Bank, Wegmans Food Markets donated more than 53,990 pounds of food to five food banks in Maryland on June 6. This is in conjunction with additional deliveries of more than 50,380 pounds to four food banks in Virginia on the same day. Eight of the food pantries will receive a half truckload of food, which includes canned soups, vegetables and fruit, along with peanut butter, canned tuna, pasta, cereal, baking mixes, coffee, tea and salad fixings. One Virginia pantry will receive a full truckload. In keeping with Wegmans’ roll-up-your-sleeves-and-help approach to community involvement, store employees will be on hand at each food bank to welcome and unload the deliveries. Helping feed people in need is a core commitment for the Rochester-based supermarket chain. Last year Wegmans donated more than 16 million pounds of fresh and non-perishable foods to food banks across all of its market areas. The stores also make it easy for shoppers to support local hunger relief efforts through donations at checkout. 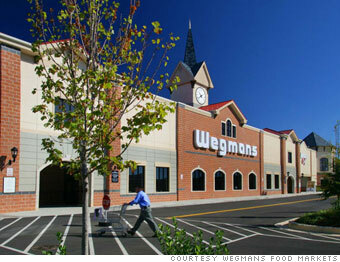 In 2012, Wegmans raised more than $2.3 million across all its stores through this program. One hundred percent of the money goes directly to local food banks. The tractor trailers, filled with non-perishable food, will arrive at the following food banks on Thursday, June 6, at the approximate times listed and weather permitting. Anne Arundel County Food Bank 10, 704 lbs. Harford Community Action Agency 11,613 lbs. Howard County Community Action Council 10,783 lbs. Frederick Community Action Agency 10,369 lbs. ACTS Food Pantry 10,616 lbs. Food For Others 10,626 lbs.